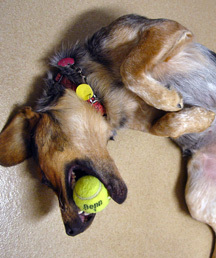 Play-biting and mouthing are normal behavior for puppies. However, it is important to redirect the puppy with toys and not hands, arms, or pant legs. There are several ways to correct mouthing behavior. When your puppy puts his mouth on your skin, you squeal “Arrp!” This should be done in a high-pitched voice, so you sound like a littermate. Do not jerk your hand away from the puppy or swing your arms around, as this looks like a fun game for your puppy. If your puppy puts his mouth on you again, “Arrp” and ignore your puppy. This may mean that you need to leave the room for a minute to provide a "time-out." You are teaching your puppy that when he puts his mouth on you, all attention leaves. Avoid any rough-housing or pushing and shoving games with your puppy. These activities encourage more biting and inappropriate behavior. Redirect your puppy’s mouth to a suitable toy. When his mouth is on the toy, praise and reward your puppy with your attention. Puppies quickly learn they can get away with mouthing small children. Supervise children and young puppies. If mouthing does occur, an adult should be present to correct the behavior. Teach children to always have a toy in each hand when going to play with the puppy. Always having a toy to offer the puppy is an easy way to encourage proper interaction. Teach children the importance of the "time-out" exercise, discussed above. Bitter Apple is a product that can be sprayed on human hands, feet and clothing. It is designed to discourage the puppy from putting his mouth on something by leaving an unpleasant taste in his mouth. NEVER spray bitter apple in the puppy’s mouth! Bitter Apple can be purchased from Animal Antics at the Wisconsin Humane Society. Begin manners training as soon as possible to help establish boundaries with your puppy. 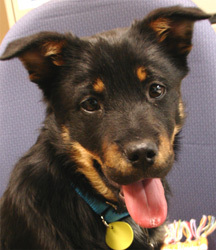 The Wisconsin Humane Society offers the class Puppy ABC’s specifically for puppies under 5 months of age. Adolescent dogs go through a stage of mouthing. These dogs are trying to determine what is acceptable behavior. It is NEVER acceptable for a dog to put his mouth on your skin, clothes or shoes. In addition to the tips above, there are other things you can do to curb your adolescent's mouthing behavior. If your dog places his mouth on you during play or any time you are interacting with him, leave the interaction for about 30 seconds. When you return, if your dog puts his mouth on you, leave again. Increase the amount of time you remain gone to one minute. Continue this until you can return to the interaction without your dog putting his mouth on you. Take your dog to a manners class. Even if your dog attended a puppy class, a manners class can be a great re-fresher and can help re-establish appropriate boundaries. The Ozaukee and Wisconsin Humane Societies offer classes designed specifically for dogs 6 months and older. Increase the amount of exercise your dog is getting. You can exercise your dog frequently, throughout the day. This will help him expend energy in an appropriate way and allow him to spend more time with you. Provide your dog with interactive toys and encourage him to work. Examples of interactive toys include Kongs, Busy Buddies, Starmark™ Treat Dispensing Chew Ball, and PlushPuppies, all of which you can purchase at Animal Antics. You can rotate and switch these toys on a regular basis to keep him busy.